Talky Walky tries to convince Lucy Weber of the existence of superheroes and fails; Barbalien’s lover is killed and he enacts bloody revenge on Mars; Abrahamn Slam gets a harsh dose of reality; and just as Talky’s about to end it all . . . This series is so good; in the DC world, this whole alternate reality/superheroes never existed storyline would probably take six issues so it could be neatly packaged as a trade paperback. Here it’s already half way over in two issues. The team strike a massive propaganda blow against the Reich and, unknown to them, that’s enough to get Uncle Sam back on his feet in the Heartland, the idea space where he’s been resting for decades. As the Fuhrer begins to suffer doubt and anxiety, that’s enough to get Sam back into the real world and delivering his first blow against the Nazis. Another good, solid issue that brings more info about the Fighters’ dynamic as well as moving the story along nicely. Confronted by Blackfire and her troops, Starfire loses control and almost kills the lot of them before the rest of her team manage to calm her down. While they end up leaving Tamaran, they at least have a lead on Darkseid’s location and head off to find him, unaware that Blackfire is setting Rapture – the ex-follower of Azrael – on their trail. Finding Darkseid, the League save him from the Eskaton and he promises to tell them the truth of his plans. As much as I like Joshua Williamson’s other stuff – BIRTHRIGHT in particular – the early issues of this series seemed a little all over the place. Dan Abnett seems to be tightening up the story and it’s working better. Talky Tawny makes his first appearance in the series, being arrested for “not being a proper tiger” before we see the various Shazam family kids in the other magic lands where King Kid has sent them. The King reveals to Billy that every time a child turns 18, they’re sent to the Below where they work to keep Funland fun – and that’s where Mary’s ended up. And back at the Rock of Eternity, Black Adam turns up to find to find the place deserted. Remember when Geoff Johns seemed to be writing everything in the DCU? Sure there were mis-steps along the way (FOREVER EVIL instantly springs to mind) but when he was good (JSA, TEEN TITANS, INFINITE CRISIS) he was good. So far, this is a return to form. The Terrifics face off against Java’s Dr Dread and the Dreadfuls, overcoming the multiversal bad guys and finally bonding as a team through choice rather than circumstance. This is the end of Jeff Lemire’s run on the series and it’s been great fun; this has consistently been one of my favourite titles as it doesn’t take itself too seriously, has some great dialogue, and remembers (almost alone amongst the DC titles) that they’re part of a multiverse. Sad to see Lemire go, but I hope the new team continue the same feel. Posted on Sunday, March 31, 2019 Saturday, April 20, 2019 by GaryPosted in Sunday ReviewsTagged Black Adam, Blackfire, Darkseid, Freedom Fighters, Shazam, Starfire, Talky Tawny, Uncle Sam. I’m going now to read both Black Hammer and Freedom Fighters. I’m really enjoying Black Hammer and all of the spin-offs so far, other than Cthlu-Louise. Not interested, but otherwise Lemire’s got me hooked on this universe of his. Cthu-Louise was probably the weakest spin-off; it was a nice joke in the main series but didn’t need an expansion, I think. Agreed. 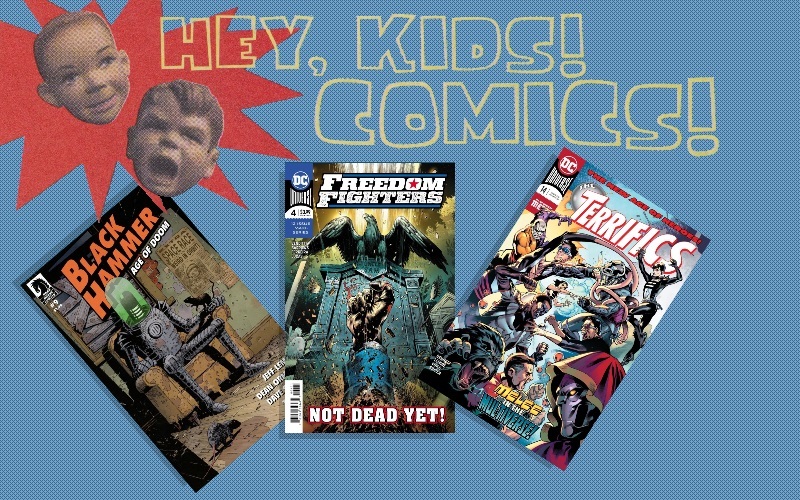 Read both of the latest issues of Black Hammer and Freedom Fighters and man are they both getting really, really good.